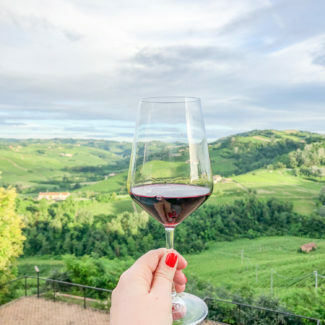 When you think of Italy, you probably think of Rome, Florence, Venice, and Naples – you probably don’t think of Piedmont. In America we throw around the term “Italian Food” when each region of Italy has it’s own cuisine. 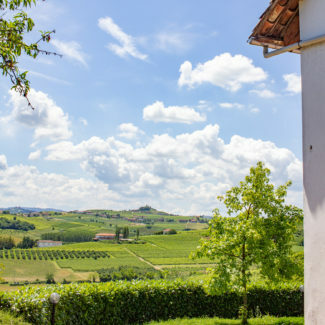 Piedmont is a region in Northwest Italy known for making some of the best wines in the world. 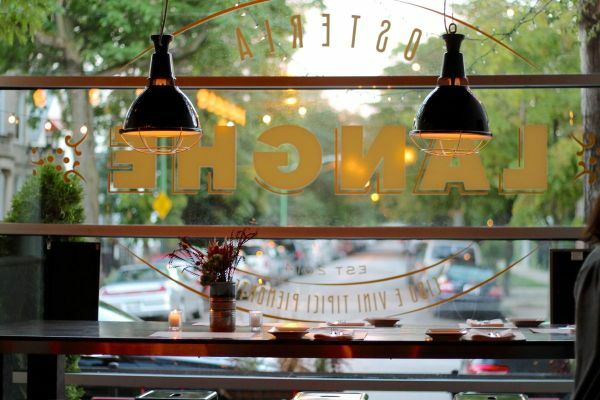 While I was familiar with Piemontese wines, I knew less about the food, until my recent meal at Osteria Langhe, a restaurant that opened near Logan Square last year. This meal was a well timed introduction to Piemontese food; I am going to be spending a couple days in Piedmont next week tasting wine, hunting for truffles, and eating my heart out. 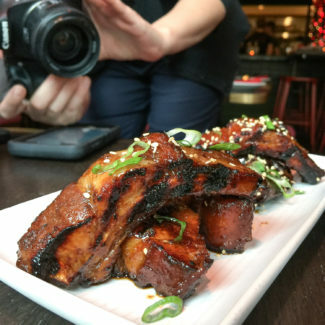 I was dining with my friends and fellow food bloggers Alex, Brett, and Erica, and we may have ordered an aggressive amount of food, but we just couldn’t help ourselves, the food was heavenly and we wanted to try it all. When we arrived at Osteria Langhe we were greeted by Aldo Zaninotto, the restaurant’s owner. He told us his story of how parents were Italians who ran an Italian restaurant in Belgium, and how it was his dream to have a restaurant of his own. 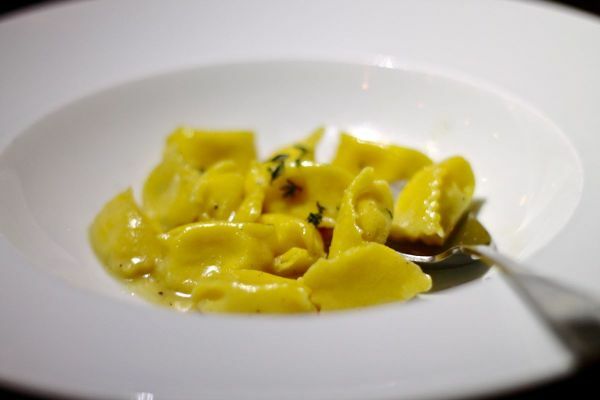 In 2014, he opened Osteria Langhe to introduce Chicagoans to Piemontese cuisine. Aldo explained that the menu changes often, but that their are some classic dishes that will always be on the menu. 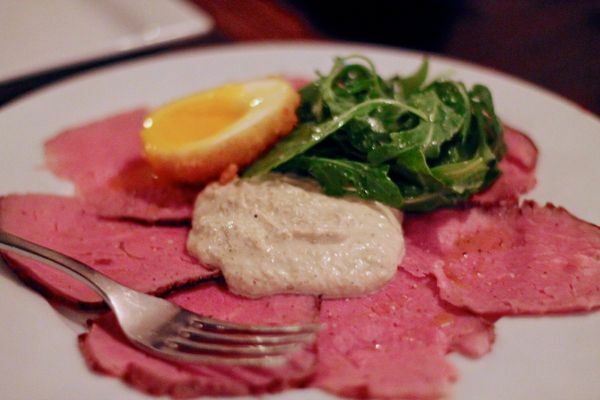 We started with a very traditional Piemontese dish that Aldo recommended, Vitello Tonnato is poached beef with a tuna, citrus, and caper aioli with a scotch egg. Osteria Langhe’s chef, Cameron Grant, is Scottish and he added his own twist to the antipasti. The poached beef was tender and juicy and the rich aioli was a fitting pairing. 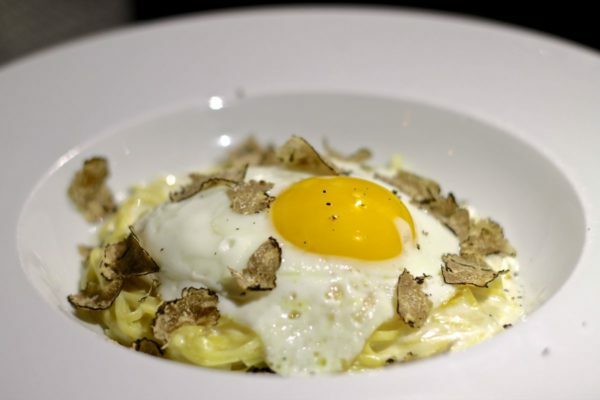 The Tajarin Tartufo Nero had thin fresh noodles drown in a creamy fontina sauce with truffle shavings topped with a sunny side up egg. The rich bold flavors of the fontina, truffle, and egg yolk were able to balance each other and not overwhelm. I especially enjoyed the texture of the very thin noodles that were effective at holding the sauce. The Polipo, grilled octopus with a chilled leek and potato crema, gained flavor through the process of grilled, but was sous vide first so the texture of the octopus was soft and not rubbery. Generally, octopus isn’t my favorite, but I did enjoy this. I speak for everyone when I say that our favorite dish was the Plin, small hand pinched ravioli with la tur, Parmesan, thyme, and butter. 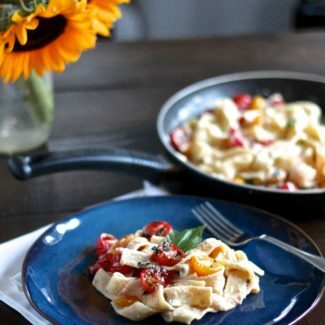 These simple flavors of pasta, cheese, butter, and thyme came to life. I want to explain that la tur is a cheese that comes from Piedmont that is made with a mix of goat, cow, and sheep milk. 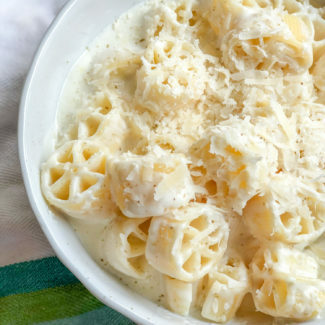 Cheeses like this that are made from a blend of cheeses are my favorite, they have a richer more complex flavor, and pair wonderfully with pasta. 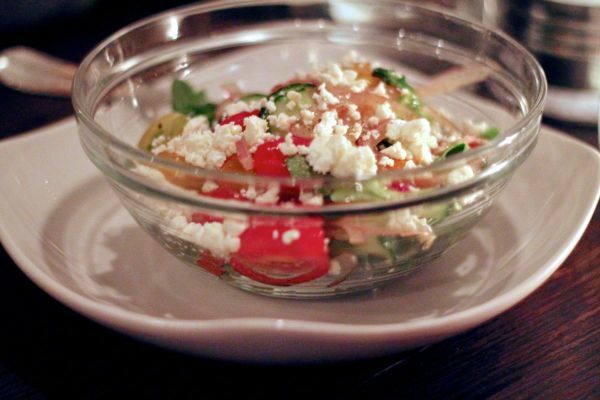 The Pomodoro, was a simple salad of heirloom tomato, cucumber, red onion, and arugula with feta and barolo vinegar. This is a seasonal item that is just wonderful this time of year. The simple ingredients made for a refreshing salad that served as a bit of a palate cleanser considering all the rich cheesy food we ordered. Then we moved on to Secondi. That’s right, we had five appetizers. 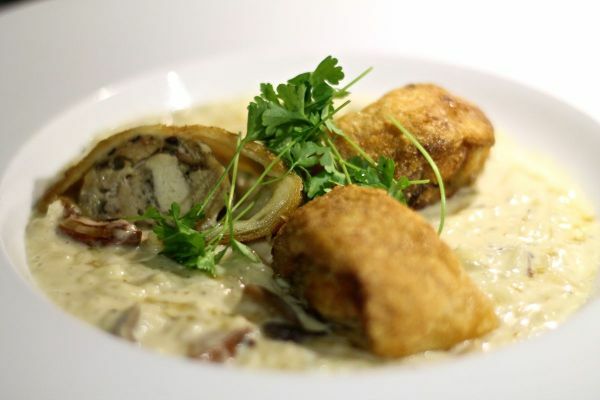 The risotto changes nightly, and the night we were dining it came with a chicken thigh and mushroom filled puff pastry on top. The risotto was positively loaded with cheese, and I loved it. The texture was perfect, it had just the right amount of firmness to be slightly chewy and not overcooked. 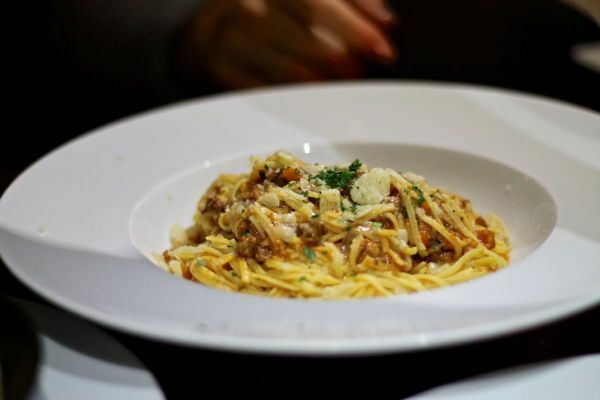 The Tajarin, house made pasta with a meat ragu. Again, this had the thin fresh noodles, but this time it was topped with a meat ragu. We did wish that there was a bit more ragu on the pasta. My favorite entree was the Tagliata, a Piemonese New York Strip Steak with gorgonzola and madiera glace and crispy potatoes. 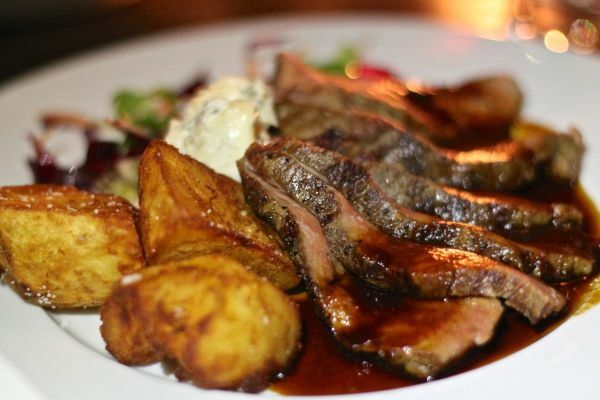 In a city full of steakhouses you might not think to order steak at an Italian restaurant, but this medium rare steak could rival any steak in the city. We devoured it. The extra crispy potatoes were a fun side. 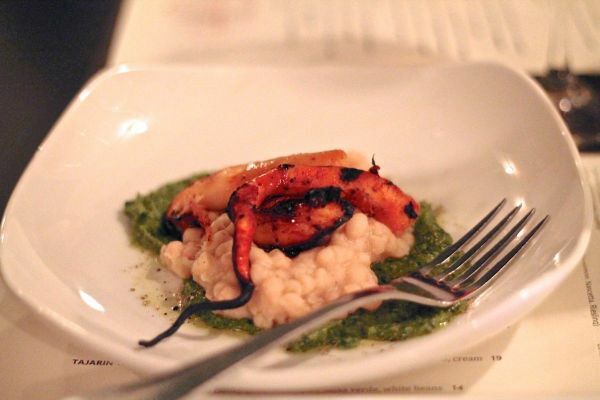 The Crespella, the vegetarian entree, was the most creative thing we tried. 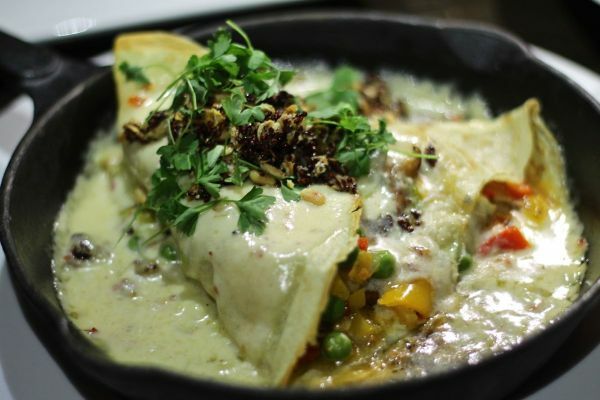 Crepes were filled with peas, asparagus, goat cheese, wild mushrooms, and a spicy leek fonduta, topped with a whole grain granola. The surprising thing about this dish was the spicy heat from the peppers that gave the dish and almost Mexican twist. The slight spice was balanced by the leek fonduta. Regrettably, we did not save room for dessert. 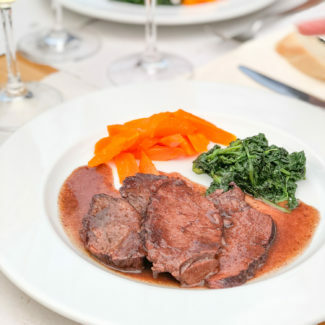 Osteria Langhe is the place to go if you want to try Italian cuisine beyond the typical red sauce Italian food so common in America. We loved our meal, it was as though the passion of Aldo and Chef Grant made the food taste even better. Osteria Langhe‘s address is 2824 West Armitage. They do accept reservations.